The Tour de France is more than a bike race. It’s a theatre with many plays, plots and stories. Spectators enjoy the countryside, business deals are done and a lot of people work hard to make the show happen. British broadcaster Ned Boulting is among the workers as he travels around France to put the race on television. In the wake of Leeds grand départ Boulting has written up his experiences of this year’s Tour along with other anecdotes and more. What had happened to my life? How had it come to pass that the oversized, lurid marketing float of an international sugary conglomeration now bore more comforting familiarity, more relevance, meant more to me than my academic home for those formative years… …when did Haribo replace Victor Hugo in my life? The horror of a plastic blueberry on wheels trumping Hugo is one thing but Boulting is also delighted by the race if not the commercialism. Perhaps it’s the studies but language matters for Boulting. He analyses the bland vocabulary of many a pro cyclist on Twitter or in interviews – hard to blame them when they’re so tired – and offers a few pages on the dilemma of pronunciation. He’s fluent in German so when Jens Voigt goes on the attack does he say “Focht” or “Voyt” because the first is the correct way to say Voigt and the second is the most common way, the expected form among the audience. The answer? There is none, he even admits that he once used one version and then the other later on in the same broadcast. 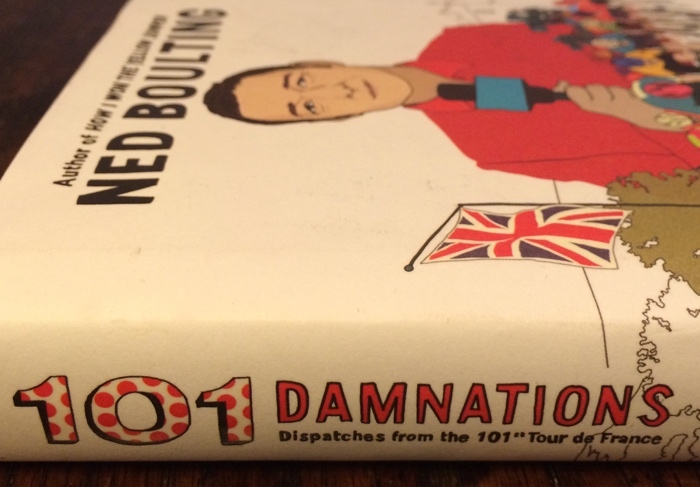 The book features a range of anecdotes from the Tour, whether buying beer with David Millar, chatting to Peta Cavendish, Dave Brailsford crashing his sports car or the more predictable descriptions of hotels en route. There’s work too, take interviewing Peter Sagan. As part of the daily post-stage protocol the wearers of each jersey must parade past all of the main television channels for a quick interview. Sagan isn’t loquacious, at least not when interviewed in English and Boulting describes the struggle to get him to say something original and sometimes just to get him to say anything. This year’s race was big on commemoration with the route tracing the events of a century ago and this is mentioned but also used as a means to explore history, whether the Tour’s history one hundred years ago or a wide look at France at times. He captures images of the race well and other details around whether the gaudy caravan or “uninspiring towns whose houses bore the trademark cladding of diamond-shaped downward-pointing concrete tiles on their flanks”, places enlivened for a day before they return to normal. There’s a look at more history including things I never knew, like the role of the Cointreau brothers – they of the drink – in the 1903 Tour de France or the story of the world champion and hour record holder who finished up as a getaway driver for an armed robbery gang. There’s a look at more recent history too such as a tribute to Didi Senft, better known as El Diablo. That’s quite a quote and makes several things clear, for example on the role-sharing with John Degenkolb or his willingness to be a specialist for obvious, lucrative reasons. Moments like this make the book much more than notes from a race in 2014. I feared the publisher’s brief (“we need a book about last summer’s Tour de France in Britain but the tale of Nibali winning unopposed won’t sell”) and worried the book would be an collection of first-person diary notes spun into a hardback. Fortunately the book seemed to get better and better with often entertaining dispatches and the diversions into history and linguistics work well. It’s recommended for a British audience, others might miss some of the cultural references although many English-speaking fans will spot Boulting’s amusement at some Liggetisms (“Lourdes is a Mecca for Catholics”) and more. Buy it if y0u’re keen to relive the summer coverage of the Tour and you’ll be rewarded by the extras. Note: this book was sent free for review by the publishers Yellow Jersey Press and is priced £14.99 / CAN$24.99. Thanks for the low-down, INRNG. If anything, Ned’s insights will bring comfort for us in the northern hemisphere when this supposed weather-bomb hits. Although, I’d like to think we’ll be pleasantly surprised and give it’s contents the attention it deserves. Nothing wrong with reliving good-times, and will certainly get me more clued up on Le Tour. Fascinating, thank you! I thought Kittel was meant to be upset at missing out on MSR previously. Guess that was just a media invention then. I don’t remember much trouble over Milan-Sanremo? Maybe mixing it up with the Bouhanni/Demare issues? I’ve read Ned’s previous book “How I Won The Yellow Jumper” dozens of times and it’s possibly my favorite cycling realted book out there. Then i heard about this one and thought it would be a rushed addendum because of Yorkshire hosting the start. But like so many times before you’ve sold me on the book. Instantly added to my Christmas list and i look forward to reading it! East Germany? Are you sure about that? East fixed to eastern. Much of the description of Thuringia by Boulton is full of GDR references. Erfurt is in East Germany. So what? We still say East and West here in Germany. Like we say North and South Germany. We have the four points of the compass. As someone who has now watched thirty Tours de France, I feel that Phil was better than many and I easily forgave his sometimes bewildering obliviousness to reading race tactics, not to mention his generous portions of doddering chatter, but he lost me for good when he became a full-time Lance fanboy, apologist and conspiracy theorist. I was rather amazed- and continue to be- that he was not ushered directly to pasture after the Lance debacle with his lack of impartiality and rabid defense. And I’d be further thrilled if Mr. Senft would join Mr. Ligget in retirement. They’ve imposed themselves quite enough on Le Tour for one lifetime. Unlike “the Ligget”, Mr. Senft retired this year. So Phil’s the one who has to join. Boulting finds money making niche for MAMIL’s stocking filler partners. Sorry, did I type that out loud. Better that than some achingly a la mode coffee table book on Classic Italian Steel Singlespeeds or The History of Rapha (lots of black and white photos and an intro from Paul Smith) for festive hipsters. Both are equally valid ways of appreciating cycling, no need to be snarky. While I *am* a man, I’m not (quite) middle-aged and have literally never worn lycra. I do have an Italian bicycle made of steel, but it’s got proper gears, and I own not a shred of Rapha schmattes. Not sure which demographic I’m supposed to fit in. Help! I will read Ned’s book though (in paperback, mind). LOL – quite the picture, the yellow “jumper”, as my seven year old is wearing his one-piece “onesie” yellow minion pyjamas. I should put that on my Christmas list! Thanks for the review, I enjoy Ned on the cycling podcast, and will now look for this book. I think he originates around the sport of professional football.